مطالعات ریزدیرینه‌شناسی سیستماتیک انجام ‌شده روی توالی‎های کربناته سازند تیرگان در برش‌های چینه‌شناسی باختر روستای طاهرآباد و یال جنوبی تاقدیس اشلیر در خاور حوضه رسوبی کپه­داغ، به شناسایی جنس و گونه‌های متنوعی متعلق به خانواده­های Dasycladaceae، Triploporellaceae، Udoteaceae، Solenoporaceae و Gymnocodiaceae از جلبک‌های آهکی و نیز نمونه­هایی متعلق به ریزمرجانیان راسته Gorgonacea انجامیده است. در این میان و بر پایه اندازه­گیری‎های بایومتریک شاخصه­های ریختاری، 16 جنس و 20 گونه در برش طاهرآباد و 12 جنس و 16 گونه نیز در برش تاقدیس اشلیر شناسایی شده­اند. همچنین گونه­های Permocalculus minutusوPermocalculus? halimedaformis از جلبک‎های آهکی Gymnocodiaceae برای اولین بار از توالی‌های کربناته سازند تیرگان گزارش می‌شوند. گونه Permocalculus? halimedaformis که نخستین بار در منطقه Minis Valley رومانی یافت شده بود؛ در این پژوهش برای اولین بار از ایران و دومین بار در جهان معرفی می­شود. بر این اساس، گسترش جغرافیایی گونه یاد شده در لبه شمالی نوتتیس، بیش از 2800 کیلومتر به سوی تتیس خاوری گسترش می­یابد. Micropaleontological study on the carbonate successions of the Tirgan Formation at the Taherabad village and Eshlir anticline stratigraphic sections is led to identification of various taxa of the calcareous algae belong to the families Dasycladaceae, Triploporellaceae, Udoteaceae, Solenoporaceae and Gymnocodiaceae and also some specimens of small Gorgonacea. Based on the biometric measurements of morphological features, 16 genera and 20 species from the Taherabad section and 12 genera and 16 species from the Eshlir section have been recognized. Moreover, Permocalculus minutus and Permocalculus? halimedaformis have been found for the first time in the Tirgan Formation. Permocalculus? halimedaformis was introduced from the Minis Valley in Romania for the first time and its finding in this research is the second report around the world. According to this new finding, its geographic distribution is being extended more than 2800 km eastward on the northern margin of the Tethys ocean. افشارحرب،ع.، 1373- زمین‌شناسی ایران: زمین‌شناسی کپه‌داغ، سازمان زمین‌شناسی و اکتشافات معدنی کشور، 275 ص. صادقی، م.، رشیدی، ک. 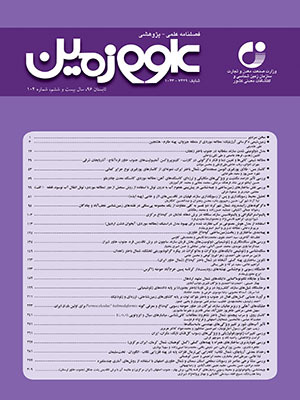 و شعبانیان، ر.، 1394- معرفی جلبک‌های آهکی خانواده داسی­کلادآسه­آ و ژیمنوکدیاسه­آ پرمین، در برش چینه‌شناسی پیراسحاق، جنوب جلفا، با گزارشی از حضور جنس Tabasoporellaداسی­کلادآسه­آ در شمال باختر ایران، فصلنامه علمی پژوهشی علوم زمین، سال بیست و چهارم، شماره 95، صص. 55 تا 63. طاهرپور خلیل­آباد، م.، 1392- چینه‎نگاری سنگی و ریزچینه‌نگاری زیستی (روزن‌داران و جلبک‌های آهکی) سازند تیرگان در حوضه رسوبی کپه‌داغ، شمال شرق ایران. رساله دکترای تخصصی، دانشگاه آزاد اسلامی واحد تهران شمال، 417 ص. طاهرپور خلیل‌آباد، م.، وزیری، س. ح.، آریایی، ع. ا. و عاشوری، ع. ر.، 1393- کاربرد روزن­بران کف­زی و جلبکهای آهکی در تعیین مرز توالی های بارمین پسین- آپتین پیشین (مطالعه موردی سازند تیرگان در غرب حوضه رسوبی کپه‎داغ). دوفصلنامه دیرینه شناسی، 2 (2)، صص. 180 تا 197. موسویان، س. م.، صادقی، ع. و آدابی، م. ح.، 1393- جلبک­های آهکی سازند شاه­کوه (کرتاسه پیشین) در جنوب غرب خور (ایران مرکزی)، فصلنامه زمین‌شناسی ایران، سال هشتم، شماره 30، صص. 97 تا 107. همتی، س.، قادری، ع.، عاشوری، ع. ر.، طاهرپور خلیل‌آباد، م.، 1395- روزن­داران کف­زی و جلبک‌های آهکی سازند تیرگان در برش‌های طاهرآباد و اشلیر (خاور حوضه رسوبی کپه­داق): محدودیت‎ها و کاربردهای آن‌ها در مطالعات زیست‎چینه­ای، دوفصلنامه رخساره­های رسوبی. Abyat, A., Afghah, M., Kohansal Ghadimvand, N. and Feghi, A., 2012- Microbiostratigraphy and Lithostratigraphy of Fahliyan and Gadvan Formations in Kuh-e-Surmeh (Zagros Basin, Southwest Iran). Advances in Environmental Biology, 6 (12): 3078-3086. Bakalova, D., 1971- Nouvelles espèces de Dasycladaceae (Algae) dans les sédiments urgoniens du Prebalkan central. Bulgarian Academy of Sciences - Committee of Geology, Bulletin of the Geological Institute, Sofia (Series Paleontology), 20: 123-127. Barattolo, F., 1984- Su alcuni organi riproduttori isolati di Dasicladacee nel Cretacico dell' Appennino. Bollettino Della Societa dei Naturalisti in Napoli, 92: 1-33. Barattolo, F., Cozzi, A. and Romano, R., 2008- New dasycladalean algae from the Middle Norian (Upper Triassic) of northern Italy (Mt. Pramaggiore, Carnic Prealps). Facies, 54: 549-580. Barrier, E. and Vrielynck, B., 2008- Map 6: Middle Aptian (121.0 e115.0 Ma). In: Barrier, E., Vrielynck, B. (eds. ), Palaeotectonic maps of the Middle East: tectonosedimentary-palinspastic maps from the Late Norian to Pliocene. Commission for the Geological Map of the World (CGMW/CCGM), Paris. Basson, P. W. and Edgell, H. S., 1971- Calcareous algae from the Jurassic and Cretaceous of Lebanon. Micropaleontology, 411-433. Baud, A., Brandner, R. and Donofrio, D. A., 1991- The Sefid Kuh Limestone - A Late Lower Triassic Carbonate Ramp (Aghdarband, NE-lran). Abhandlungen der Geologischen Bundesanstalt, 38 (S): 111-123. Bernier, P., 1979- Une nouvelle espece d'algue dasycladale: Terquemella concava nov. sp., dans les calcaires a “tubulures” d'age portlandien de la Cluse-des-Hopitaux (Jura meridional). Geobios, 12 (4): 597–603. Bignot, G., 1981- Illustration and paleoecological significance of Cretaceous and Eocene Girvanella limestones from Istria (Yugoslavia, Italy). In Phanerozoic stromatolites (pp. 134-139). Springer Berlin Heidelberg. Brusca, R. C. and Brusca, G. J., 2003- Invertebrates (2nd Edition). Sinauer Associates, 936 p.
Bucur, I. I. and Sasaran, E., 2005- Relationship between algae and environment: an Early Cretaceous case study, Trascău Mountains, Romania. Facies, 51(1-4), 27. Bucur, I. I., 1994a- Algues calcaires de la zone de Resita-Moldova Noua (Carpathes Meridionales, Roumanie). Rev. Paleobiology, 13: 147–209. Bucur, I. I., 1994b- Lower Cretaceous Halimedaceae and Gymnocodiaceae from Southern Carpathians and Apuseni Mountains (Romania) and the systematic position of Gymnocodiaceae. Beitr Palaontology 19: 13–37. Bucur, I. I., 2000a- Lower Cretaceous dasyclad algae from the Padurea Craiului massif (Northern Apuseni Mountains, Romania). Acta Paleontology Romaniae, 2 (for 1999): 53–72. Bucur, I. I., 2000b- Provincialism of some Lower Cretaceous dasyclad algae from Mid and Eastern Europe; paleogeographic significance. 31st International Geological Congress Rio de Janeiro (CD Rom, Abstracts). Bucur, I. I., 2002a- Nouvelles de couvertes de dasycladales fossils dans les depots du Cretace inferieur de la zone de Resita-Moldova Noua (Carpathes Meridionales, Roumanie). Acta Paleontology Romaniae, 3 (for 2001): 41–52. Bucur, I. I., 2002b- New remarks on Kopetdagaria sphaerica Maslov, 1960. In: Bucur I.I., Filipescu, S., (eds. ), Research advances in calcareous algae and microbial carbonates. Cluj University Press, Cluj-Napoca, 83–94. Bucur, I. I., 2008- Barremian-Aptian calcareous algae from Romania: an overview. Bollettino Della Societa Geologica Italiana e Del Servizio Geologico d'Italia, 127: 245–255. Bucur, I. I., 2011- Early Barremian dasycladalean algae from Serre de Bleyton (Drome, SE France). Annalen des Naturhistorischen Museums in Wien. Serie A fur Mineralogie und Petrographie, Geologie und Palaontologie, Anthropologie und Prahistorie, 619-653. Bucur, I. I., Granier, B. and Sasaran, E., 2008- Upper Aptian calcareous algae from Padurea Craiului (Northern Apuseni Mountains, Romania). Geology of Croatica, 61: 297–309. Bucur, I. I., Rashidi, K. and Senowbari-Daryan, B., 2012- Early Cretaceous calcareous algae from central Iran (Taft Formation, south of Aliabad, near Yazd). Facies, 58 (4): 605-636. Bucur, I. I., Senowbari-Daryan, B. and Majidifard, M. R., 2003- Neocomian microfossil association from the Taft area near Yazd (Central Iran). Facies, 49: 217–222. Carevic, I., Ljubovic-Obradovic, D., Bozinovic, M. and Jovanovic, V., 2010- Upper Barremian-lower Aptian Urgonian limestone in the Rakova bara section (Carpatho-Balkanides, ne Serbia): Analysis and comparison with areas. Bulletin of the Serbian Geographical Society, Tome XC, (1): 1-16. Carevic, I., Taherpour Khalil Abad, M., Ljubovic-Obradovic, D., Vaziri, S. H., Mirkovic, M., Aryaei, A. A., Stejic, P. and Ashouri, A. R., 2013- Comparis ons between the Urgonian Platform carbonates from eastern Serbia (Carpatho-Balk anides) and northeast Iran (Kopet-Dagh Basin): Depositional facies, microfacies, biostratigraphy, palaeoenvironments and palaeoecology. Cretaceous Research, 40: 110–130. Casazar, G., Mehl, D., Oberhauser, R. and Lobi-Tzer, H., 1994- A comparative study of the Urgonian Facies in Vorarlberg (Austria), im Allgau (Germany) and in the Villany Mountains (Hungary), Jubilaumsschr. Jubilaumsschr, 20, 145-207. Chiocchini, M., Chiocchini, R. A., Didaskalou, P. and Potetti, M., 2008- Microbiostratigrafia del Triassico superiore, Giurassico e Cretacico in facies di Piattaforma carbonatica del Lazio centromeridionalee Abruzzo: revisione finale, Mem. Descr. Carta geologica d’italia, 5–170. De Castro, 1963- Nuove osservazioni sul livello ad Orbitolina in Campania. - Bollettino Della Societa dei naturalisti in Napoli, 71: 103-135. De Castro, P., 1991- Mesozoic, in: 5th International Symposium on Fossil Algae, edited by: Barattolo, F., De Castro, P., and Parente, M., Field Trip Guide-Book, Giannini, Napoli, 21–38. Di Lusia, M., Trecalli, A. Mutti, M. and Parente, M., 2012- Bio-chemostratigraphy of the Barremian-Aptian shallow-water carbonates of the southern Apennines Italy- Plnpointing the OAE1a in a Tethyan carbonate Piatform. Solid Earth, 3, 1–28. Dragastan, O. N. and Herbig, H. G., 2007- Halimeda (Green Siphonous Algae) from the Paleogene of (Morocco) - Taxonomy, Phylogeny and Paleoenvironment. Micropaleontology, 53, (1/2): 1-72. Dragastan, O., 1969- Algues calcaires du Jurassique superieur et du Cretace inf6rieur de Roumanie. Rev. Micropaleontology, 12 (1): 53-62. Elliott, G. F., 1955- Fossil calcareous algae from the Middle East. Micropaleontology 1:125–131. Elliott, G. F., 1957- New calcareous algae from the Arabian Peninsula. Micropaleontology, 3(3): 227–230. Elliott, G. F., 1959- New Calcareous algae from the Cretaceous of Iraq.-Rev. Micropaleontology, 1(4): 217-222. Elliott, G. F., 1963- Problematical microfossils from the Cretaceous and Palaeocene of the Middle East. Palaeontology, 6(2): 293-300. Flugel, E., 2010- Microfacies of carbonate rocks. Springer, Berlin- NewYork, Heidelberg, p. 976. Frollo, M. M., 1938- Sur un nouveau genre de codiacee du Jurassique superieur des Carpates orientales. Bulletin de la Socieatea Geaologique de France, 5, 8(3-4): 269-271. Granier, B. and Deloffre, R., 1993- Inventaire critique des Alques Dasycladales fossiles. IIº partie: Les Alques Dasycladales du Jurassique et du Cretace [Revision of fossil dasyclad algae. 2nd part: dasyclad algae of Jurassic and Cretaceous – in French]. – Rev. de Paleobiology, 12/1, 19–65. Granier, B. and Michaud, F., 1987- Deloffrella quercifoliipora n. gen. n. sp., une Algue Dasycladacée nouvelle du Kimmeridgien et du Portlandien du Sud-Est du Mexique. Bulletin de la Societe geologique de France, Paris, (8eme serie), t. III, n° 6, p. 1089-1096 (Pl. I). Granier, B., 2013- Dissocladella hauteriviana MASSE in MASSE et al., 1999 (non MASSE, 1976), another lower Urgonian Dasycladalean alga revisited. Carnets de Geologie, Letter 2013/07 (CG2013-L07): 1-9. Granier, B., Dias-Brito, D. and Bucur, I. I., 2008- Calcareous algae from Upper Albian – Cenomanian strata of the Potiguar basin (NE Brazil), Geologia Croatica 61/2–3 311–320. Groves, J. R., Larghini, C., Nicora, A. and Rettori, R., 2003- Mississippian (Lower Carboniferous) microfossilsfrom the Chios Mélange (Chios Island, Greece). Geobios 36: 379–389. Hanifzadah, R., Rashidi, K. and Shahkarami, M. A., 2015- Barremian-Aptian Biostratigraphy in Yazd Block, Central Iran. Open Journal of Geology, 5(06), 405. Hosseini, S. A. and Conrad, M., 2008- Calcareous algae, foraminifera and sequence stratigraphy of the Fahliyan Formation at Kuh-e-Surmeh (Zagros Basin, SW of Iran). Geologia Croatica, 61/2-3: 215-237. Hughes, G. W., 2005- Calcareous algae of Saudi Arabian Permian to Cretaceous carbonates. Revista Espanola de Micropaleontologia, 37(1), 131-140. Husinec, A. and Sokac, B., 2006- Early Cretaceous benthic associations (foraminifera and calcareous algae) of a shallow troPlcal-water Piatform environment (Mljet Island, southern Croatia), Cretaceous Research, 27:418–441. Husinec, A., Velic, I. and Sokac, B., 2009- Diversity patterns in Mid-Cretaceous benthic foraminifers and dasycladalean algae of the southern part of the Mesozoic Adriatic Platform, Croatia. In Geologic Problems Solving With Microfossils: a Volume Dedicated in Honor of Garry D. Jones. SEPM. Ivanova, D. and Kolodziej, B., 2010- Late Jurassic-Early Cretaceous foraminifera from Stramberk-type limestones, Polish Outer Carpathians, Studia Universitatis Babeş-Bolyai, Geologia, 55 (2): 3 – 31. Johnson, J. H., 1961- Jurassic algae from the subsurface of the Gulf coast. – J. Paleontol., 35/1, 147–151. Kirmaci, M. Z., Koch, R. and Bucur, I. I., 1996- an early Cretaceous section in the Kirkaova area (Berdiga Limestone, NE Turkey) and its correlation with Piatform carbonates in W-Slovenia. Facies 34:1–22. Kuss, J. and Conrad, M. A. 1991- Algae from Cretaceous Carbonates of Egypt, Sinai, and Southern Jordan. Journal of Paleontology, 65(5): 869-882. Kuss, J., 1994- Cretaceous (Albian-Turonian) Calcareous Algae from Egypt and Jordan -Systematics, Stratigraphy and Paleogeography. Abhandlungen Der Geologichen Bundesanstalt, 50: 295-317. Lamouroux, J. V. F., 1816- Histoire des PolyPlers coralligenes flexible vulgairement nommes. Zoophytes. F. Poisson, Caen, 559. Maksoud, S., Granier, B. and Dany, A., 2014- First record of Harlanjohnsonella annulata Elliott in Granier and Deloffre, 1993, non 1968, a Triploporellacean alga in Upper Barremian - Lowermost Bedoulian strata of Lebanon. Acta Paleontologica Romaniae, 10 (1-2), p. 47-60. Mamet. B. and Rudolff, B., 1972- Algues carboniferes de la partie septentrionale de l Amerique du Nord. Rev Micropaleontoloy,15: 75-114. Mancinelli, A., 1992- Distribuzione delle dasycladali (alghe verdi) nei sedimenti del Cretacico inferiore in facies di Piattaforma carbonatica dell’Appennino centro-meridionale (Lazio e Abruzzo). Studi Geologici Camerti, 12, 7-29. Maslov, V. P., 1960- Novye vodorosly mela Kopet Daga: Turkmenya. Dokl Akad Nauk SSSR, 134: 939–941 New Cretaceous algae of Kopet Dagh: Turkmenia. English translation in Paleontol (1035–1037). Morellet, L. and Morellet, J., 1913- Les dasycladacees du Tertiaire parisien. Geology Society France Meme, 25(1), 1-43. Morellet, L. and Morellet, J., 1922- Nouvelle contribution a letude des Dasycladacees tertiaires.- Memoires de la Societe geologique de France, Paris, (Paleontologie), 252 (58): 33 . Nicholson, H. A. and Etheridge Jr, R. 1880- A Monograph of the Silurian Fossils of the Girvan District in Ayrshire, with Special Reference to Those Contained in the “Gray Collection”. 1 (1): 1-198. Parvaneh Nejad Shirazi, M., 2008- Calcareous algae from the Cretaceous of Zagros Mountains (SW Iran). World Applied Science Journal, 4, 803-807. Parvaneh Nejad Shirazi, M., 2009- Green algae from the Lower Cretaceous carbonates of northern Shiraz (Zagros Mountains, SW Iran). History Biology, 21:91–98. Pascher, A., 1931- Systematische Ubersicht uber die mit Flagellaten in Zusammenhang stehenden Algenreihen und Versuch einer Einreihung dieser Algenstamme in die Stamme des Pflanzenreiches.- Beihefte zum Botanischen Centralblatt, Jena, Band XLVIII, Heft 3, p. 17-332. Pfender, J., 1939- Sur un calcaire phytogene du Lias inferieur d’Espagne et l’extension de ce facies en quelques autres regions. Bulletin de la Societe Vaudoise des Sciences Naturelles, 60:213–228. Pia, J., 1920- Die Siphoneae verticillatae vom Karbon bis zur Kreide.- Abhandlungen der zoologisch-botanischen Gesellschaft in Wien, Band XI, Heft 2, 259 p., 8 Pls. Les Siphonees verticillees du Carbonifere au Cretace 1961- Editions Technip, Rueil-Malmaison, 258 p., 8 Pls. Pia, J., 1927- Thallophyta, In: Hirmer M (ed) Handbuch der Palaobotanik, Band 1: Thallophyta, Bryophyta. Pteridophyta, Oldenburg, Munchen, pp 31–136. Pia, J., 1930- Upper Triassic fossils from the Burmo-Siamense frontier: a new dasycladacea, Holosporella siamensis nov. gen., nov. sp. with description of the allied genus Acicullela Pia. Geological Survey India, 63(1):177–181. Pratt, B. R., 2001- Calcification of cyanobacterial filaments: Girvanella and the origin of lower Paleozoic lime mud. Geology, 29(9): 763–766. Radoicic, R., 1980- Contribution to the reconsideration of a group of cylindroporelliform dasyclads.- Bulletin de l'Academie Serbe des Sciences et des Arts, Beograd, (Classe des Sciences mathematiques et naturelles, Sciences naturelles), 20: 109-115. Radoicic, R., 2002- Dasycladalean Algae from the Lower Cretaceous of the Mt. Rujen (Vardar Zone, Macedonia). – Rev. Paleobiology, 21: 7–19. Radoicic, R., 2005- New Dasycladales and microbiota from the lowermost Valanginian of the Mirdita Zone. Annales Gologiques De La Pninsule Balkanique, (66): 27–53. Riding, R., 1991- Calcareous Algae and Stromatolites. Springer – Verlag, Unated Kingdom, p. 563. Robert, A. M. M., Letouzey, J., Kavoosi, M. A., Sherkati, S., Müller, C., Verges, J. and Aghababaei, A., 2014- Structural evolution of the Kopet Dagh fold-and-thrust belt (NE Iran) and interactions with the South Caspian Sea Basin and Amu Darya Basin. Marine and Petroleum Geology, doi: 10.1016/j.marpetgeo.2014.05.002. Ruggiero, M. A., Gordon, D. P., Orrell, T. M., Bailly, N., Bourgoin, T., Brusca, R. C., Cavalier-Smith, T. M. D., and Kirk, P. M., 2015- A higher level classification of all living organisms. PLoS One, 10 (4): e0119248. Saint - Marc, P., 1974- Etude stratigraphique et micropaleontologique de I' Albian, du Cenomanian et du Turonien du Liban. - Noteset Meme du Moyen Orient, 13: 1-342. Schaffner, J. H., 1922- The Classification of Piants. XII. The Ohio Journal of Science. v22. no5: 129-139. Schlagintweit, F. and Gawlik, H. G., 2009- The incertae sedis Carpathoporella Dragastan, 1995, from the Lower Cretaceous of Albania: skeletal elements (sclerites, internodes/branches, holdfasts) of colonial octocorals. Facies, 55 (4): 553-573. Schlagintweit, F. and Wilmsen, M., 2014- Calcareous algae (Dasycladales, Udoreaceae, and Udoteaceae) from the cenomaniean Altamir formation of northern Cantabria, Spain. Acta Paleontologica Romaniae, 10 (1-2): 15- 24. Schlagintweit, F., Kołodziej, B. and Qorri, A., 2015- Foraminiferan-calcimicrobial benthic communities from Upper Cretaceous shallow-water carbonates of Albania (Kruja Zone). Cretaceous Research, 56, 432-446. Sepkoski, J. J., Jablonski, D. and Foote, M., 2002- A compendium of fossil marine animal genera. Bulletins of American paleontology, 363:1–560. Steinmann, G., 1899- Ueber fossile Dasycladaceen von Cerro Escarmela, Mexico. Bot Z 57:137–154. Stewart, K. D. and Mattox, K. R. 1978- Structural evolution in the flagellated cells of green algae and land Piants. Biosystems 10 (1–2): 145–152. Taherpour Kalil Abad, M., Schlagintweit, F., Ashouri, A. R. and Aryaei, A. A., 2009- Juraella bifurcata Bernier, 1984 (Calcareous alga, Gymnocodiaceae?) from the Lower Creta-ceous (Barremian) Tirgan Formation of the Kopet Dagh basin, north-east Iran.- Journal of Alpine Geology, 51: 79-86. Taherpour Khalil Abad, M., Conrad, M. A., Aryaei, A. A. and Ahouri, A. R., 2010- Barremian-Aptian Dasycladalean algae, new and revisited, from the Tirgan Formation in the Kopet Dagh, NE Iran.Carnets Geology/Notebooks Geology Art 2010/05 (CG2010-A05). Taherpour Khalil Abad, M., Schlagintweit, F., Vaziri, S. H., Aryaei, A. A. and Ashouri, A. R., 2013- Balkhania balkhanica Mamontova, 1966 (benthic foraminifera) and Kopetdagaria sphaerica Maslov, 1960 (dasycladalean alga) from the Lower Cretaceous Tirgan Formation of the Kopet Dagh mountain range (NE Iran) and their paleobiogeographic significance. Facies, 59(1), 267-285. Toula, F., 1884- Geologische Untersuchungen im westlichen Theile des Balkan und in den angrenzenden Gebieten. X Von Plrot nach Sofia. Sitzungsberichte k. Akademia der Wissenschaften, I, Abth, 88 (3-5): 1279-1348. Wray, J. L., 1977- Calcareous algae. Elsevier, Scientific Publishing Company. Amesterdam, p. 185.